Today’s the day for the final ‘topping out’ ceremony at the new Walton Bridge – and thanks to the organisational efforts of our local boat clubs, there will be a sail past to mark the event along with a number of other events. Not missed: Boat skippers will be delighted to see the back of the old bridges whose supporting piers made navigating around the bend in the river a tricky business. Things get under way at 9.30am on the Walton side of the river with speeches from those involved in the design, planning and construction of the crossing and a formal cutting of a ribbon. That will be followed by a procession of vintage cars before attention switches to the Shepperton end of the bridge where local schoolchildren will help to bury a time capsule to mark the event. At around 10.30am, a plaque will be unveiled on the centre of the bridge and that will be followed by the sail past. The flotilla will be led by Fuzz, the ex-police boat owned by Jenny Beagle who manages Bridge Marine boatyard, which stands in the shadow of the new structure. Behind Fuzz there will be representatives from local canoe and rowing clubs before cruisers and other craft from Weybridge Sailing Club, Desborough Sailing Club and Weybridge Mariners will pass under the bridge. A word of congratulation to all those involved in the organisation of this floating tribute – and particularly to Ian Mawson from Weybridge Sailing Club who came up with the idea in the first place. The bridge will not be opening to traffic today because the remodelling of the roads leading onto it is still to be carried out but it should be operational within the next couple of weeks according to Surrey County Council. Once the new crossing is fully functional, attention will switch to the demolition of the two old bridges that have carried traffic across the river for the past few decades. Amazing really when you consider that both those bridges were only designed to be temporary solutions! 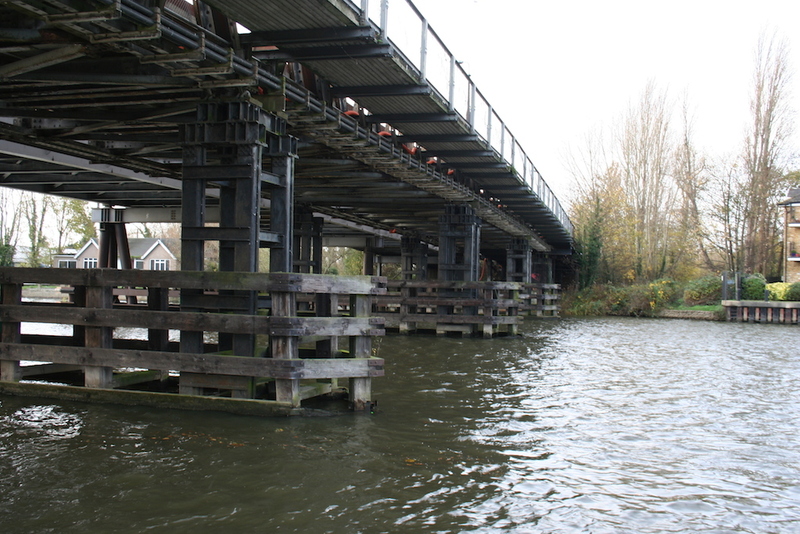 Certainly, boat skippers will be delighted to see the back of them because they make navigating around the bend in the river quite tricky because of the restricted width caused by the supporting piers and the lack of visibility. And you have to say that when they are removed, the new bridge will be a beautiful replacement. THE strict financial restrictions and spending cuts that we’ve heard so much about recently are generally hitting hard in many areas but there has been one piece of news recently that is music to the ears of any Thames users. Parliamentary Under-Secretary for Natural Environment and Fisheries, Richard Benyon, announced in a written Commons statement [PDF] last week that plans to transfer responsibility for the Thames from the Environment Agency to the Canal and River Trust were going to be postponed until Defra’s financial situation improved. Mike Shefras, chairman of the Thames Users Group, is delighted at the news. He reckons that this will mean the Thames staying under EA control for the next three to five years at least – giving us lots of time to persuade the Government that they should leave responsibility for looking after the river to the Agency which has done an exceptional job in very difficult circumstances.